According to estimates, around a million people suffer from a shingles outbreak each year in the US alone. Moreover, about one in every three people will suffer from the condition at one pint during their lives. (1) Being such a common condition, it is not surprising that people are looking for natural remedies to treat the condition. Shingles causes nerve pain, fever, itching and painful blisters while a weak immune system may make the symptoms even worse. Fortunately, there are a number of potential natural remedies for shingles including the essential oil that this article will be focusing on. Shingles is a viral infection characterized by a painful rash. While you may find a shingles flare up on any part of your body, it is most commonly found on the left or right side of your torso, forming a single stripe of blisters. A virus called varicella-zoster, which lives dormant in your body after you’ve suffered from chicken pox, causes shingles. Shingles is not considered a life-threatening condition, however, complications may arise. Diagnosing shingles early and seeking treatment is the best way to avoid these complications while also helping to shorted the duration of the painful rash. The same virus that causes chicken pox, the varicella-zoster virus, causes shingles. Anyone that has suffered through the itchy illness of chicken pox may develop shingles down the line. Once you endure chicken pox, its possible for the virus to enter your nervous system and lie dormant for years until its ready to emerge with a vengeance, leaving a trail of painful blisters on your skin. Right now it is not quite understood why shingles affects some people and not others. One theory is that our immune systems grown weaker as we age, therefore making us more vulnerable to falling victim to the virus. Shingles occurs in roughly 10% of people who have previously had chickenpox. Age is another obvious risk factor. Unfortunately, your chances of developing shingles increases significantly with age. Around half of the cases of shingles occur in people aged over 50. Can you Develop Shingles if you haven’t had Chicken Pox? HOWEVER, if you come into direct contact with someone who is ill with shingles and has open sores, you can become infected with the varicella-zoster virus and come down with chicken pox if you are re not immune to chicken pox. While chicken pox may not seem like a big deal, it can be potentially dangerous for those with compromised immune systems or infants and women who are pregnant. Who is Most at Risk for Shingles? Those older than the age of 50 have a higher chance of developing shingles. The older you get, the higher your chances become of developing the infection. Those that have an immune system weakened by illnesses such as cancer or HIV are at higher risk for developing shingles. Cancer treatments have a tendency to weaken the immune system and therefore increase one’s chances for coming down with shingles. Taking certain medications may trigger shingles. These medications include steroids or drugs meant to prevent your body from rejecting organs from a transplant. If you suspect you are suffering from shingles, it is important to seek medical attention right away to prevent further complications. While there is currently no cure for shingles, your physician can prescribe you anti-viral medications to help get the virus at bay and help prevent potentially dangerous complications from arising. Your physician will also prescribe you medication to help control painful symptoms. Once you’ve sought out medical treatment, there are some home remedies you can try at home to help supplement your medications and help alleviate uncomfortable symptoms. Many people find relief with essential oils. Some essential oils have been found to help not only soothe painful rashes, but possibly help speed up the healing process as well. This medicinal oil has been used to help treat many illnesses and skin conditions. Also called melaleuca oil, the antiviral agents of tea treat oil make it an excellent companion to prescribed shingles medication. Tea tree oil not only helps to kill the virus, but it has pain relieving and anti-inflammatory properties as well, helping to alleviate discomfort associated with shingles. Regularly applying tea tree oil to your shingles rash may also help to prevent scarring while the antibacterial agents help to prevent further infection from occurring. Lavender essential oil is considered a “cure-all,” helping to treat and alleviate pain associated with a variety of different illnesses. The analgesic properties of lavender essential oil are so effective, many compare this healing oil to powerful pain relieving drugs. Lavender essential oil also has antiviral properties so it not only helps relieve pain and irritation but can also help fight the virus responsible for shingles. Chamomile is a great essential oil to have on hand when going through a shingles outbreak because it helps to alleviate stress while promoting healing. When you are stressed, your immune system is compromised. It is important to relax and get proper rest while treating shingles. Bergamot essential oil is a great essential oil for treating shingles for a variety of reasons. First of all, it is s an antiviral, which means it will help fight the virus and help prevent complications. Secondly, it promotes healing, helping to decrease the healing time of the shingles rash. Last but not least, bergamot oil is an analgesic, helping to decrease the discomfort and pain of a shingles rash. 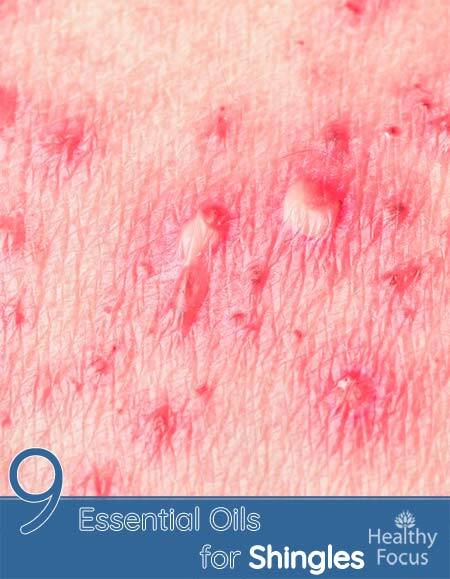 Ravensara essential oil is great for treating skin inflammation and infections. This healing essential oil is an antiviral, so it’s great for helping to fight the virus. Meanwhile, the healing properties of the oil help to shorten the healing time by clearing up the rash on the skin. If you’re experiencing pain and sensitivity, geranium essential oil is a great oil to consider in your treatment routine. Shingles causes extreme discomfort and pain, even after the rash has vanished. Applying geranium oil to your skin helps to treat this specific kind of pain. Lemongrass essential oil, also known as Melissa oil, is a powerful antiviral that helps to fight the virus associated with shingles. Lemongrass oil is considered a “hot oil” and may burn your skin, so it may be better to add this essential oil to your bath water as opposed to putting it directly on your skin. If you’re looking for an essential oil to apply directly to the skin and are interested in lemongrass oil, try purchasing oil labeled “Melissa oil,” which is much more gentle, although expensive. Manuka essential oil contains powerful antiviral and anti-inflammatory agents. Hailing from New Zealand, it is believed that this essential oil helps to prevent the spread of the herpes simplex virus, including shingles, which is a part of the herpes virus family. If you’re looking for pain relief, black cumin seed oil may be the essential oil you’re looking for. Black cumin seed oil also contains anti-inflammatory properties, which can help soothe some discomfort. There are several ways you can use essential oils to treat your shingles. You can use it topically as a massage oil. Before applying your chosen essential oil to your body, it is important to dilute it well with a suitable carrier oil. Some of the most popular include jojoba and sweet almond but there are many others to choose from. Put a few drops in your bathtub, hop in and let the essential oils get to work on your skin. Not only can a soak in an essential oil bath treat your shingles but it may also reduce your stress and boost your immune system. Make your own essential oil spray to apply to the affected parts of your body. Add 30 drops each of tea tree, lavender and eucalyptus essential oil to a spray bottle then add some fractionated coconut oil to dilute. Spray onto the affected parts of your body to soothe the pain and irritation whenever you feel the need. You can even diffuse or inhale essential oils that boost your viral defenses. By inhaling anti-viral oils, you help boost your immune system and help fight the virus. What is the best pain reliever for shingles? Topical numbing agents like lidocaine in the form of a gel, spray or skin patch . Medications containing narcotics like codeine. What not to eat when you have shingles? Food high in arginine such as peanuts, chocolate, soy beans, legumes, coconut and other nuts. Sugary foods because sugar decreases the white blood cells which help to fight infection. Caffeine and alcohol because they cause dehydration. Carbonated drinks may promote an acidic environment and should be avoided during illness. Fried foods can also promote an acidic system. Can you get shingles from stress? Technically shingles is not caused by stress, however stress can weaken your immune system putting you at a greater risk of shingles. Shingles is actually a viral sickness caused by the varicella zoster virus but a weak immune system is one of the risk factors. What can happen if shingles are left untreated? Before using essential oils to help treat your shingles, consult your physician. Never apply essential oils directly to your skin without diluting it first. Try using a carrier oil such a coconut oil or jojoba oil before application. Even after diluting your essential oils, you should perform a patch test on a discrete area of your skin to make sure you are not sensitive to it. Do not ingest your essential oil. Many essential oils are very potent and should not be used on young children whose skin is more sensitive. Shingles is a viral illness caused by the herpes zoster virus. It causes various symptoms including painful rash, blisters, fever, headache and fatigue. You should speak to your doctor if you have experienced a shingles outbreak. While there is no cure as such, antivirals may help prevent further complications and pain relief medications may be prescribed. Many essential oils have antiviral and analgesic properties that can help ease your symptoms and fight the virus while boosting your immune system. We recommend tea tree essential oil as well as lavender. Try to combine both in a massage oil or spray. If your symptoms are getting worse, please consult a doctor since left untreated, shingles can lead to further complications.